Used as a starter block during the pulling in of heavy duty cable up to 6 in. (152mm) diameter as it is pulled from a stationary or moving cable reel. Has three rollers that guide the cable with minimal friction. Cable pulled through the block has a minimum bending radius of 17 in. (432mm). Designed for use with larger cables up to 6 in. (152mm) in diameter, i.e. 750 MCM Tri-Plex Conductors. 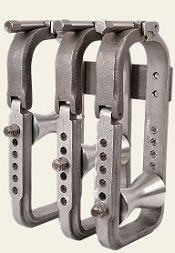 Has a heavy duty aluminum frame with stainless hardware. Can be used on strand sizes 3/8 to 9/16 in. (10 -14 mm). Capacity for up to 6 in. (152mm) diameter cable and a safe working load of up 2000 lbs (900kg). After cable and support rings are in place, the block has hinges that open at one side for easy removal.